Provides information for setting regulatory setback requirements: Shoreline monitoring allows the RI Coastal Resources Management Council to establish, track, and adjust regulatory setbacks from eroding shorelines and planning for public infrastructure and new building construction. Supports coastal planning: Data on the current shoreline, rates of change, and future impacts provide valuable information for state and local decision-makers in the shaping of the future of our coastal communities. Rhode Island’s coast defines it as the Ocean State. Although the “3% bigger at low tide” slogan is not technically correct, the idea has a nugget of truth about the smallest state in the nation. While Rhode Island ranks only 22nd out of 30 states in miles of total coastline, if you rank states by the ratio of length of coastline to acre of land area, RI jumps up to second only to Maryland. Every Rhode Islander lives within a 30-minute drive to Narragansett Bay or the Atlantic Ocean, so the influence of the shoreline on residents is exceptionally prevalent, playing an important role in our environment, economy, and overall infrastructure. 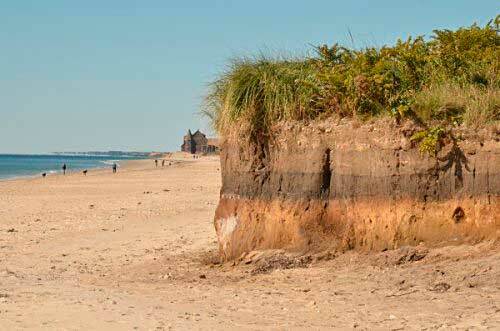 In Rhode Island’s coastal communities, increases in storminess and acceleration of sea level rise negatively impact shoreline erosion and are compromising the integrity of natural and developed coastlines. Shoreline erosion is a natural process where wave action, wind, and storm surge removes sediment from the coasts, redepositing it on an adjacent shoreline or washing it out to sea. Erosion and sea level rise are not new phenomena for Rhode Island’s shores: our soils are particularly susceptible to erosion and sea level has been gradually increasing for much of the recent past (for a total of about nine inches since 1930); however, their combined impact on Rhode Islanders—their property, beaches, and coastal communities— is growing and will continue to increase with climate change. Much of Rhode Island’s infrastructure was not designed with adequate consideration given to long-term shoreline change and even plans that did consider sea level rise may not have envisioned the increasing rates that we currently see due to more intense coastal storms brought on by climate change. In the last 40 years, sea level rise has accelerated to an average of 1.25 inches per decade, and the latest projections anticipate more than nine feet of sea level rise in the Northeast United States by 2100. Photo courtesy of RI Sea Grant. Climate change is already producing and will continue to produce more intense coastal storms with the greatest intensity in the form of hurricanes and nor’easters. Higher winds and greater wave action from these storms will generate higher storm surge—which comes ashore on top of higher sea levels—exacerbating erosion and coastal flooding. Greater storm surges on top of current sea level have the potential to greatly expand areas exposed to flooding and the projected storm surge on seas nine feet higher than current levels could be catastrophic for Rhode Islanders without immediate statewide buy-in and attention to adaptive planning. 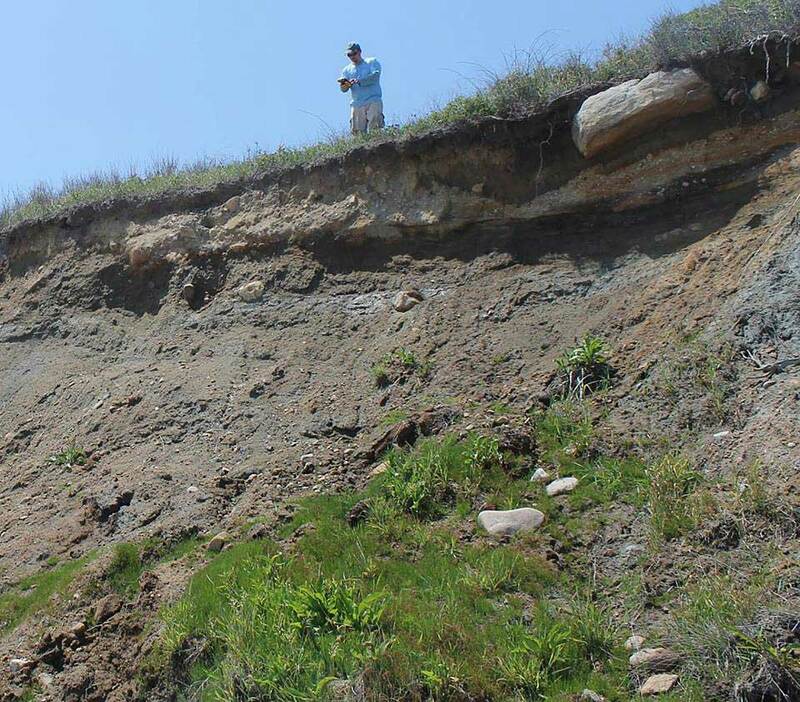 The intersection of shoreline erosion and Rhode Islanders’ close relationship with the coast is already causing infrastructure and community planning dilemmas. Monitoring shoreline change provides precise, accurate information that is essential to making coastal planning decisions.